The second restaurant from Michelin-starred chef Adam Stokes, as the name suggests, The Oyster Club is an oyster bar and seafood restaurant offering the same class of high end cuisine that has come to be expected from the Northampton-born chef. Just a short walk from Stokes' original eatery, Adams, The Oyster Club is in further good company, taking up residence underneath Temple Street's Ivy restaurant. With fresh fish sourced from all over the UK, including Newcastle, Cornwall and Scotland, the menu will specialise in simple dishes done excellently - think fish and chips made with halibut or bream, prawn cocktail and Teriyaki salmon. Given the name, there will also be a fantastic selection of oyster and condiment combinations available, and guests will be able to knock back Tabasco numbers alongside the traditional mignonette sauce and many others. Digbeth-based Faber Design have been enlisted once again to take on the interiors. 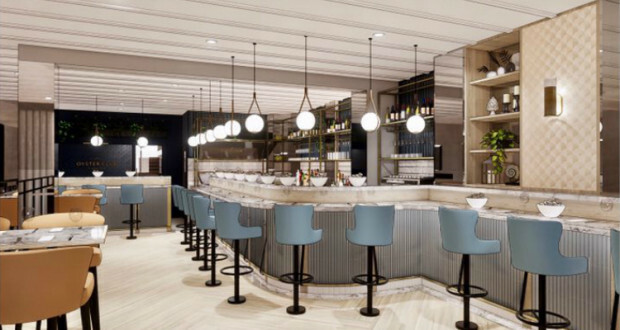 The team of architects and interior designers who were responsible for decking out Stokes' original restaurant, alongside other city gastro spots such as Lasan, Kilder Bar and Folium, will be transforming the space into a slick and relaxed environment designed to emulate the classic oyster bar experience.